I would consider myself something of a fan of the original Terminator film. And if you’ve read the Genesis review, you know how they screwed that one up. Therefore, it is with great delight that I present you with this little gem; a much better attempt at a scrolling game based on the first film. Okay, for those just joining us here’s the one-sentence plot of the film: A killing machine and a rebel commando travel back to 1984 to battle over Sarah Connor, mother of a future human leader. Done and done. You, of course, play as that rebel commando, Kyle Reece, and tussle with Ahh-nold’s invincible Terminator. The result is roughly ten levels of gun-blazing awesome. What’s there to say here? Well, everything horrible about the Genesis version is much improved here. The plot of both games is obviously still the same but this version takes its source material and is able to do so much more with it. For starters, the Genesis’ amusing one-level future war has been expanded to a multilevel feast of gunplay. The future levels definitely introduce us and set the tone for the rest of the game. Graphics are very cartoony, but look far superior to the Genesis. Explosions look particularly striking, as do the backgrounds. Flashes of light and movement clue us in to other skirmishes going on elsewhere, as you run your own gauntlet through the apocalyptic landscape. Beams and piles of concrete also scroll by in the foreground giving a nice sense of depth. Your future weapons are spare, basically a plasma rifle and a pickup to give it rapid fire. Luckily, the rifle, along with some hand grenades, are all you’ll need. 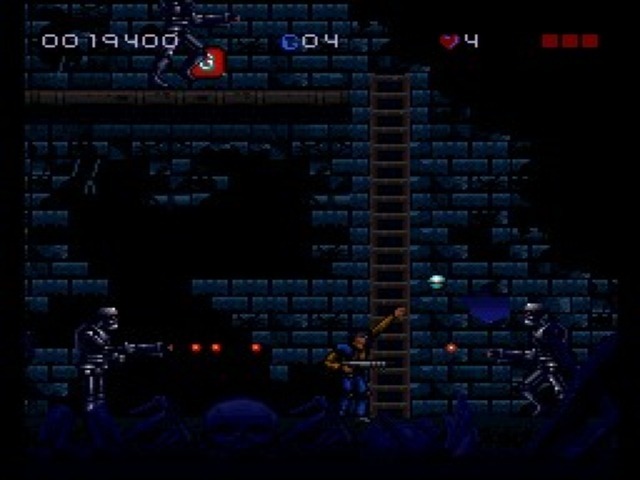 You fight patrols of metal Terminator skeletons as you go along, which are much fun to smash. Some can be blown in half and crawl after you, others fly apart in shards of metal and fire. You’ll even encounter some Arnold-esque infiltration units who look human, but the layers get peeled away as you fire on them and reveal the metal underneath. Veeeery nice. Just as you get comfortable in your future role, you’ll soon be shipped back to ’84 to start all over again. 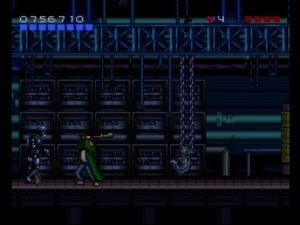 Now you have a shotgun and must attack an assorted mix of armed street punks as you make your way to find Sarah. 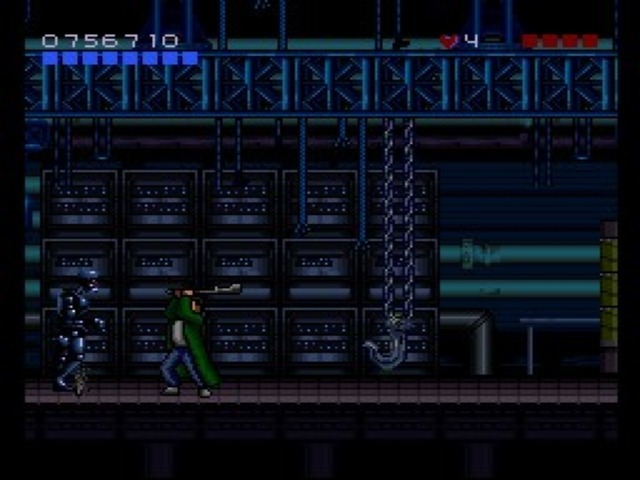 It must be noted that the game lags here considerably, as the rooftop levels are painful and difficult to play through. You never get a clear sense of where you’re going (but head to the upper right) and there are far too many ladder-to-ladder “leaps of faith” required. It just makes good sense to lay out your levels so you can see where you’re supposed to be going. Gunship helicopters also assault you, and the game locks you in place to fight them. Err… why? You seriously cannot move, which really makes you quite the easy target. Grenades and firearms make short work of the choppers, but their attacks can easily wear down your life while you have nothing to do about it. Even stranger is that you fight three in succession before a final boss, which is, as you can probably guess, a even bigger helicopter. Really the game would do well not have this level in at all, and it’s frustrating enough that many gamers understandably won’t take the time to get past it. It’s smooth sailing if you can make it through that level though. 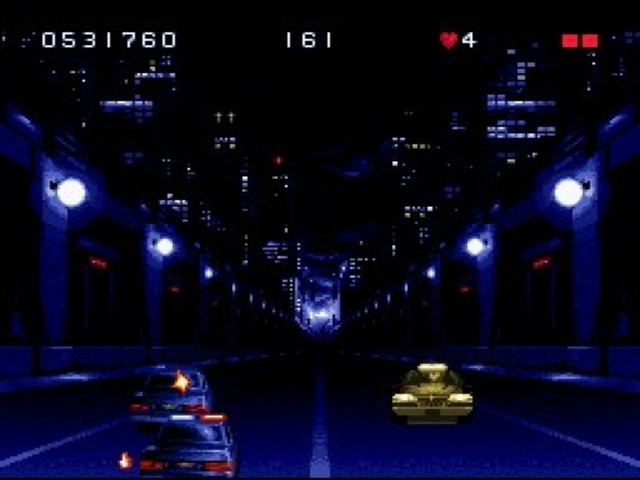 Strangely there is no fight at the TechNoir bar, scene of the first classic showdown with the Terminator, but you do play through some car chase levels that prove interesting. You can fire back at the Terminator through both sides and the back of the car, and as long as he’s getting shot, then he’s not shooting you. Careful balance of gunfire is needed to keep him at bay, while dodging oncoming traffic at the same time. It’s an unnecessary and “showy” level, but a fun one. 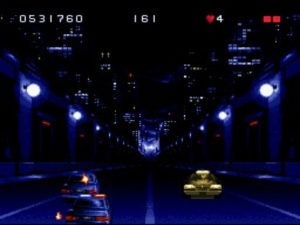 Your next stop is the police station, where you’re given a limited supply of ammunition and must avoid the Terminator. This is another confusing level, but just make sure to check all the doors by pressing the X key. Since you never used that key in the game before, that’s why it initially makes no sense. After another car chase you fight the Terminator man to manufactured man. True to the movie, you must bash him repeatedly with a large pipe before he corners you in front of a metal press. You even blow yourself up and die at the end. Ooops, I ruined it, but it’s true. This is one of the only games that rewards you for playing by killing you at the end. But you saved humanity and it’s in keeping with the film, if that makes you feel better. The game overall is very cartoonish, but that tends to work in its favor. Levels tend to go by very fast, and you can pretty much just blast your way nonstop from start to finish. If you want an action high, this game should deliver. Its only definite low point is its sound, which seems very unmatched. Background music is mostly dead-on, and probably because they’re conversions of music from the film. However, your character makes an annoying “sproing” noise every time he jumps and the other effects are just generally lacking. 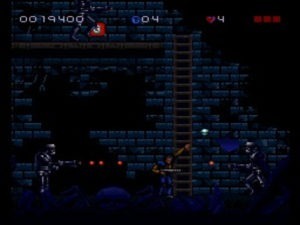 Bottom line, if you want an excellent Terminator game or a fast and enjoyable platformer, this is a good choice. Way better than the Genesis version. A few horrible and confusing levels, some “sproingy” cartoon sounds.